The Lexmark T634n is a high-speed monochrome laser printer that is perfect for workgroups with high-volume printing demands. This is one of several models in the T634 series of printers, which only vary in terms of installed memory size and/or the capacity of the standard paper input tray. It will print on a wide range of media, including plain paper, card stock, labels and envelopes. In addition to standard toner cartridges, you can use high capacity or extra high capacity cartridges to both save money and increase your productivity. An optional 500-sheet duplex unit is also available to let you use less paper for print runs. The printer weighs 19 kg and measures 406 x 436 x 513 mm. The capacity of the standard paper input tray is 600 sheets, and optional additional input trays can increase the capacity up to 4,100 sheets. To facilitate the workflow within your office workgroup, an optional 5-bin mailbox is available. In addition to USB and ethernet network connection capabilities, an optional Wi-Fi network add-on is also available. 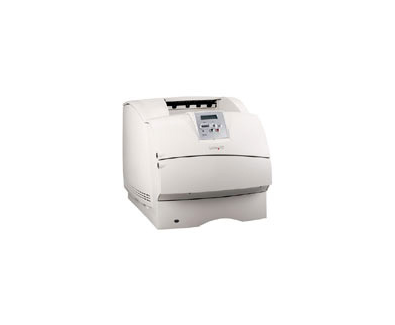 The Lexmark T634n features a 500 MHz processor and 80MB of RAM and has a rated monthly duty cycle of up to 225,000 pages. This printer has several specialised capabilities, including barcode fonts, optical character recognition (OCR) fonts and PDF printing. Optional multifunction capabilities for the Lexmark T634 provide you with affordable and convenient copying, faxing and colour network scanning functions. The time to print the first page is less than 8.5 seconds, and the print speed is 43 ppm for A4-size paper and 45 ppm for letter-size documents. Print resolution is 1200x1200 dpi. The printer does not have colour printing capabilities, which would require you to purchase an additional printer if you wish to print documents in colour. Smaller offices may find that less-expensive printers without specialised features may be more suitable for their needs.